Sometimes, all you need for a fantastic overseas culinary experience are simply high quality venues that do great renditions of what a particular culture is best known for. Stereotypes exist for a reason, after all – and that reason is usually because it’s worth trying. 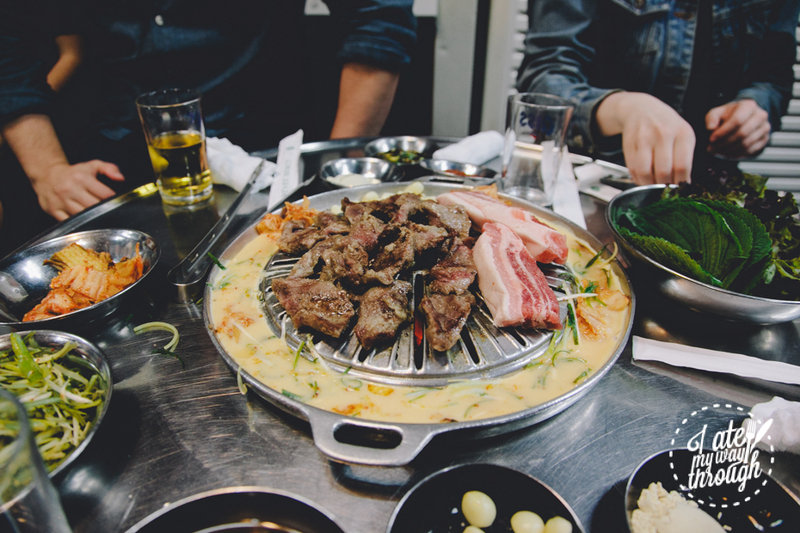 If you’ve a hankering for Korean BBQ and are curious about the enthusiastic, vibrant communal dining culture of modern Korea, the ZenKimchi Barbeque, Pub and Market (BPM) Tour is embodied by both comfort and hangover food rolled into one, perfect for the big carnivores and fried food enthusiasts in your life. Fair word of warning: this is a food tour that will be pretty heavy-duty on the arteries. That being said, going all out is the point and huge part of the fun – consume without guilt and use subsequent days to detox and munch on your vegetable sticks. We meet our tour guide, Joe McPherson, and our other dining companions at Gongdeok station in the Mapo district of Seoul. 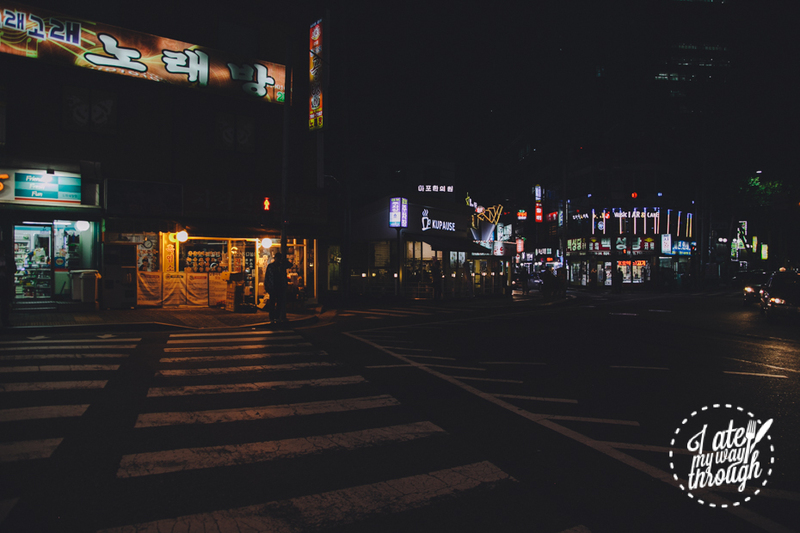 Mapo used to be a fishing town that, like many parts of Seoul, is undergoing increasing gentrification. The particular sections we visited during our food tour, however, have been protected from demolition by the local government and deemed a restaurant area. There’s nothing of the slick and stylish interiors you often see in popular Myeongdong or Hongdae eateries. 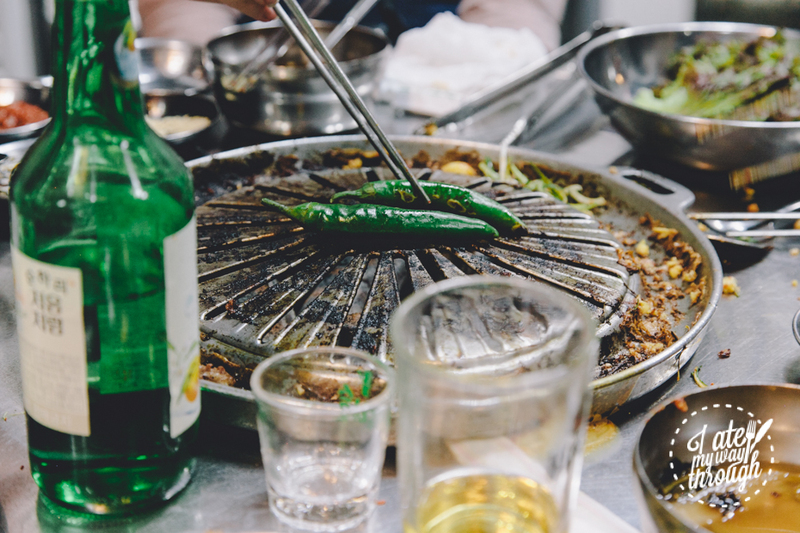 Our first venue, Galmegi Street, does Korean BBQ old school style – crowded, noisy interiors, drum tables and chairs – and has earned a tick of approval from chefs like Anthony Bourdain, who have been on the same tour. 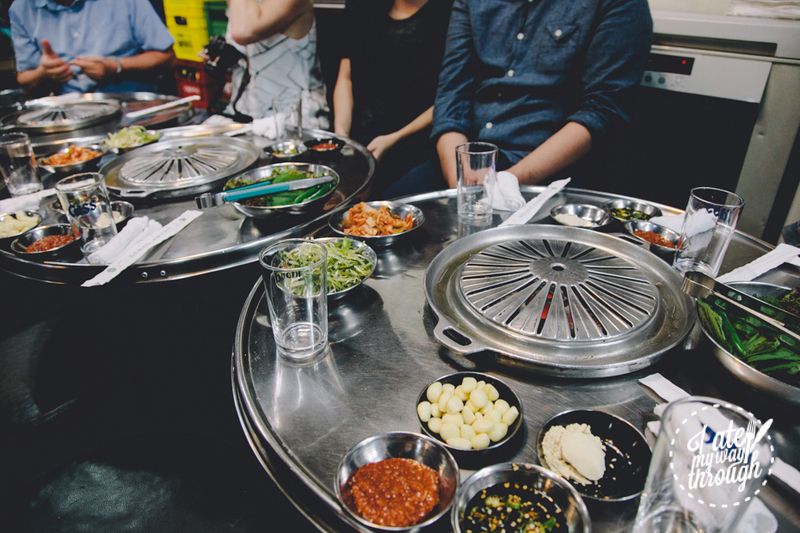 It’s filled with barbeque stoves powered by charcoal and fire instead of gas used in more modern venues, and patrolled by brutally efficient yet cheerful ajumma servers grab the tongs off your amateur meat-grilling hands to prevent an overcooked disaster. The place specialises in the ganegi (skirt steak) cut of pork that’s marinated in pepper. It’s famous to Mapo because it legitimately has the taste and texture of beef, albeit with the texture of beef you typically find in Pad See Eews or Chinese stir fries. They trim all the meat in-house and also make their own kimchi, which are all important indicators of quality, according to Joe. True to form, the ganegi and the samgyeopsal (pork belly) were fresh and tender. I particularly adored the soybean powder condiment which you’re meant to dip the meat in, which has a faintly nutty, fragrant taste. 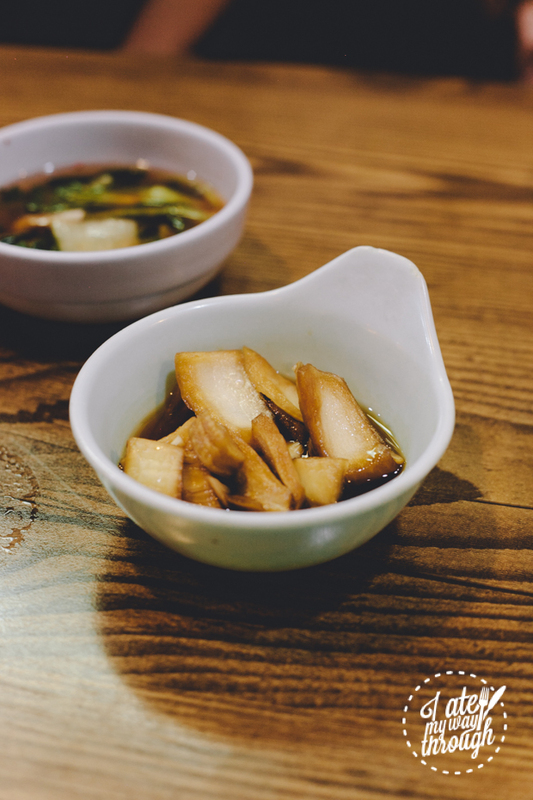 Galmegi Street’s special soy sauce mixed with vinegar also helps to break up the richness of the meat. Another trend this place has started is the ‘egg moat’, which is exactly what you think it is (egg poured into the moat to be cooked into an omelette with garlic, pepper and kimchi). Our tour guide, Joe, leads our huge, 12-member group with explosive good cheer, teaching us Korean drinking games, and punctuating conversation with regular bouts of uproarious laughter. 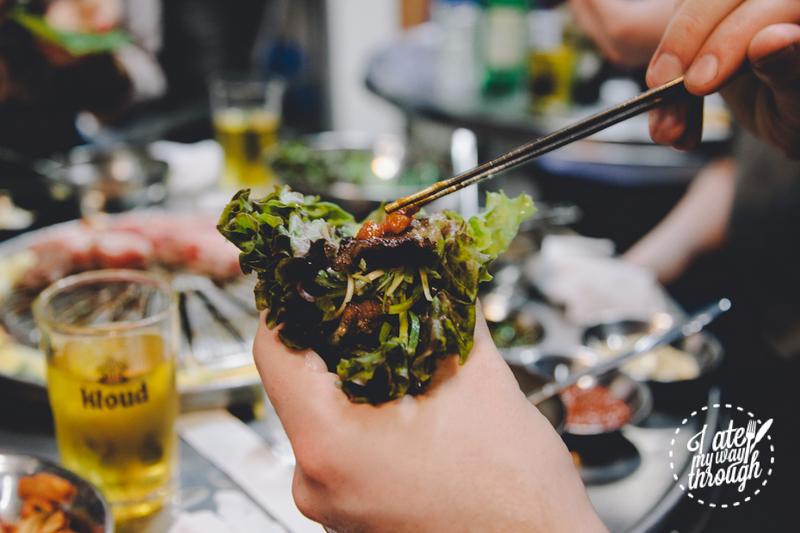 He’s great at getting everyone relaxed and participating in the very communal food culture of Korean dining. Like all the tour guides I met on this trip, he clearly has a great relationship with the owners of the restaurants he frequents. 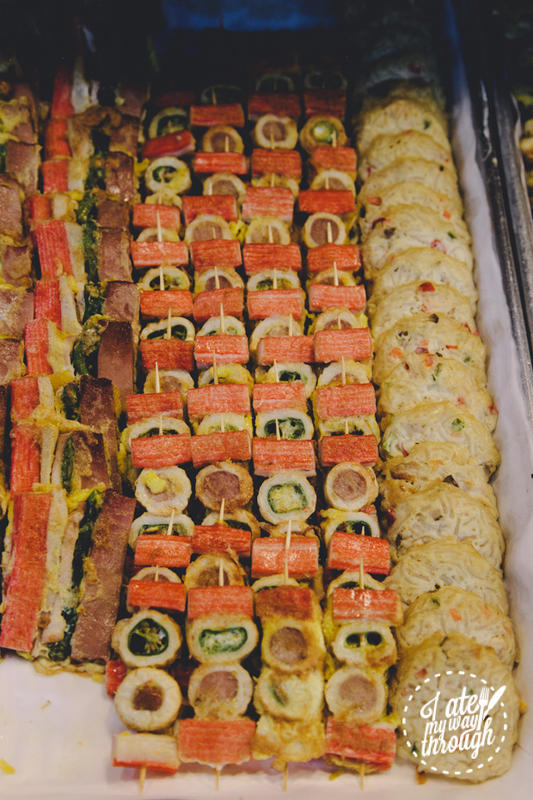 If the BBQ restaurant wasn’t enough indulgence, the next destination, Bindaeddeok Market is legitimately known as the ‘fried food market’. It’s an area consisting of street stalls absolutely packed with every single type of fried food you can imagine. “They’ll probably even fry your phone for you,” Joe tells us (do I smell a potential ‘Will it blend?‘ spinoff?). Jeong Daepo is located within a building in the market and is a large space separated into booths. We get to sit on the floor in a special section with long thin tables. What we get upon being seated at Jeong Daepo is what Joe terms the ‘Variety Dish of Fried Things’, which is exactly what it says on the package. 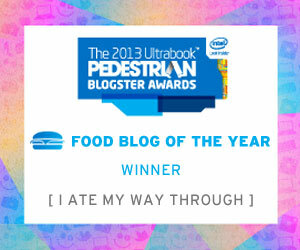 It’s not quite clear what exactly you’re eating at most points but guessing is part of the fun. 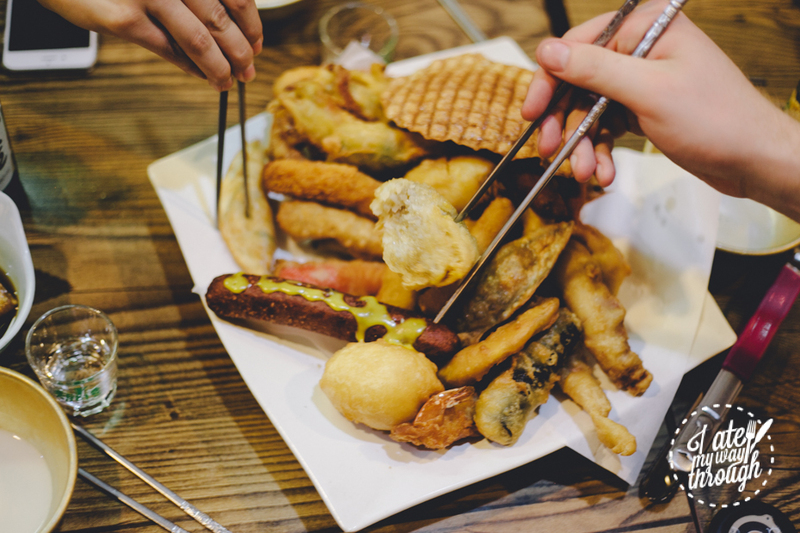 I tasted, at various points, spam, a crab stick, something that looked like a giant prawn chip, a glass-noodle-filled-dumpling, a slightly sweet fried fishcake and a mini hot dog sausage. 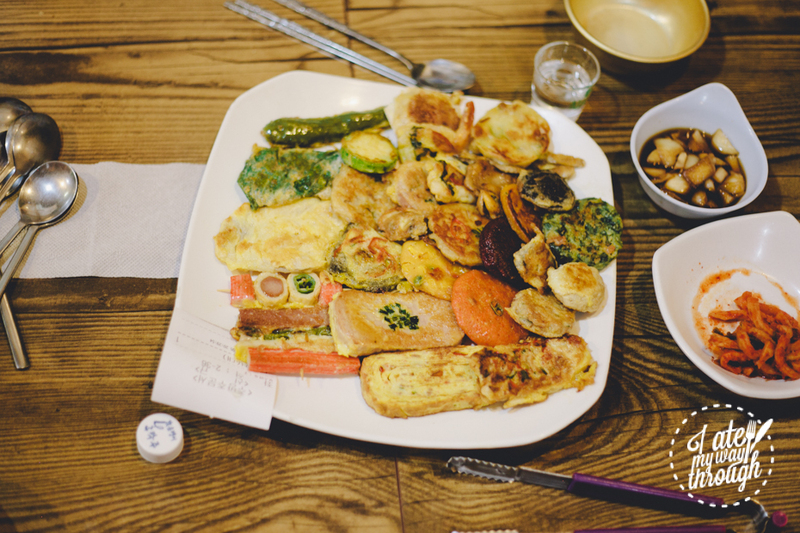 We also tried a plate of Korean jeon, or pancake, which was also filled with miscellaneous items, some of which included mushroom, peppers, zucchini, sweet potato and various iterations of meat and egg. You must try the soy-pickled onions, which give you just enough sweet, slightly acidic vinegar flavour to break up the oil. 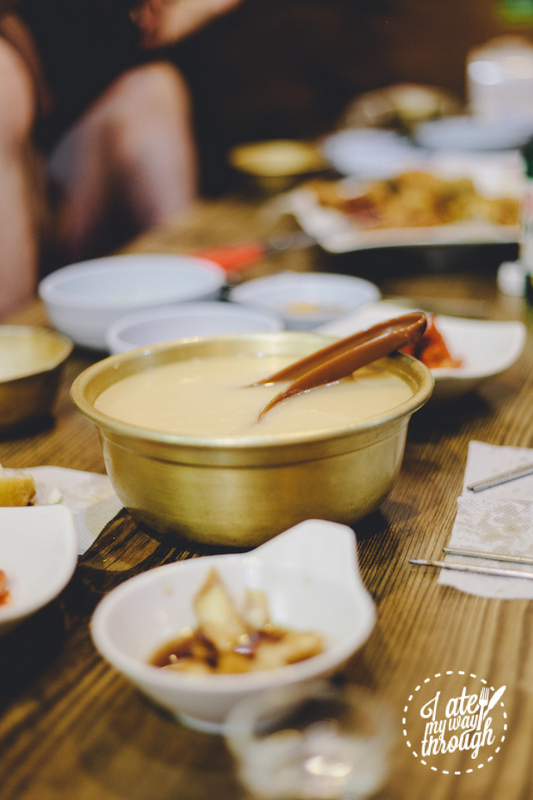 The kimchi served at this venue is ‘water kimchi’, which originates from North Korea. 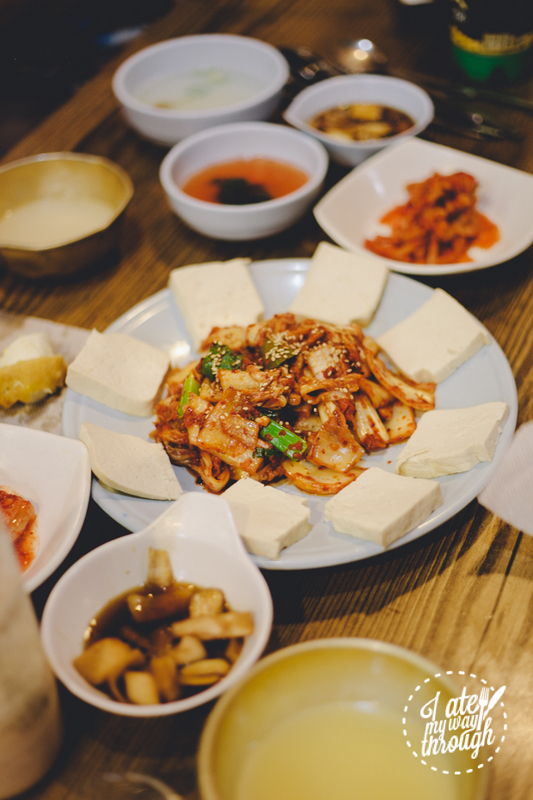 To try and save some of our arteries, Joe also ordered the kimchi pork with tofu. Joe called the tofu in this dish the ‘manliest of all tofu’ and it was indeed very densely packed, and very filling. 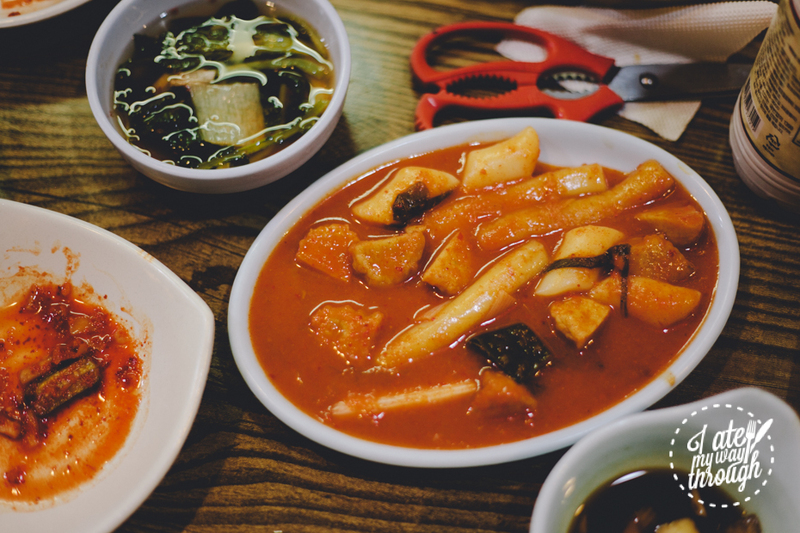 We also had some tteokbokki, which is rice cake that’s common street food in Korea, that was just swimming in sauce. 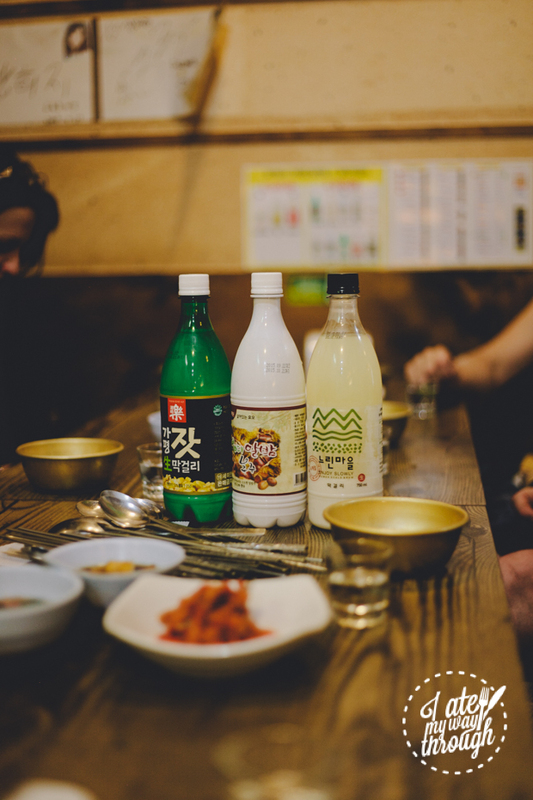 We washed it all down with various types of makgeolli (slightly less artisan than others we tasted but still refreshing) and flavoured soju (grapefruit and peach are recommended). The larger the group, the more room for variety in dishes, and the more raucous and entertaining the conversation, particularly towards the tail-end of the tour when the alcohol starts to kick in and selfie-sticks are pulled out to collective groans and cheers. The BPM tour is my definite recommendation, particularly as a way to end a Seoul trip on a fun and thoroughly satisfying note.